Previous PostLibido and pregnancy: an impossible marriage? 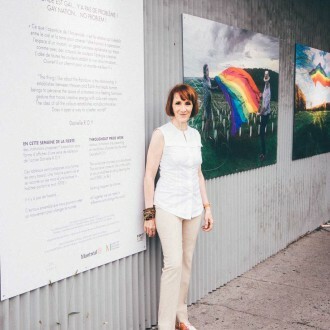 Since August 7, the exhibit Rainbowall and its sound have brightened the outside wall of the old church ‘Vie et reveille’ (formerly cinema Champlain) in the Village. It is Quebecois Danielle Roy, co-founder of Just for Laughs, that has made the temporary renewal of this building, that has been closed since 2004, possible. The exhibit also marks Roy’s third contribution of the year to benefit the LGBT community. Roy is a graphic artist, designer, and an internationally renowned stage director. She is a figure of the street arts, at the origin of the Charivari, and the annual parade Just for Laughs, where she had long been the artistic director. She is a multidisciplinary artist; she created the poster announcing the return of Charles Trenet on scene and collaborated with Franco Dragone for the creation of the Disney Cinema Parade and the urban Opera in Paris. In 2009, she signed the inaugural show of the place of the festivals, ‘Le grand baiser’ of Montreal and then, in 2011, created the Pink Carnival starring Jean Paul Gaultier. Roy has surrounded herself with the best and the list of her accomplishments is long enough to give you vertigo. And yet, still, it is always with enthusiasm and passion that she launches herself into a new project. As part of the 15th anniversary of the Emergence Foundation, President Martine Roy was looking for a single object to give the recipient of the Laurent-Mc Cutcheon award 2015. It is therefore quite naturally from her elder sister she sought inspiration. “I said to her that if I received a prize for the fight against homophobia and transphobia, I’d like to receive one of the pink balls that decorate the village, created by Claude Cormier,” tells Danielle. 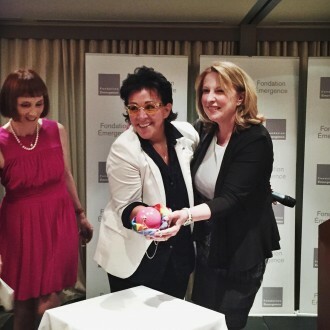 A few months later, Monique Giroux, animator of Radio Canada, received a beautiful pink ball, covered in bronze, presented in a pocket of blue suede with inner lining representing of the rainbow. “If the rainbow represents the spirit of the gay rights movement, it also evokes diversity and community—all the colors that we are, our different facets. So, I started to draw characters that are touched by the rainbow.” From this, the Rainbowall project was born. The first drawings by Roy have become seven tables, printed on the aluminum panels we see in the recent weeks on St. Catherine St., near metro Papineau. “I wanted to have large posters in the city. I started walking around looking for the perfect place and came across this wall. Written on the wall, I saw the remaining letters from the word ‘Be’. Right next to it, a quote from Cocteau: ‘We must do today what others will do tomorrow.’” Roy took the signs as an invitation to pursue the project, and pursue it at this location. At that point, there would be nothing to stop her—she had shared her work at the Museum of Fine Arts, as well as the gardens of the Ritz, and this would be next. Accompanied by the voice of the artist and her son Arthur, those who pass the wall are shown the story of conception. “The people have told me that it was good to give love to this wall. To talk about love, this is not nothing. If my images bring comfort, if they touch people, this is already a big step. But, I won’t stop there,” says Roy, sharing her intention to take a more global approach with her work. “This cause, for me, has provoked greater awareness. 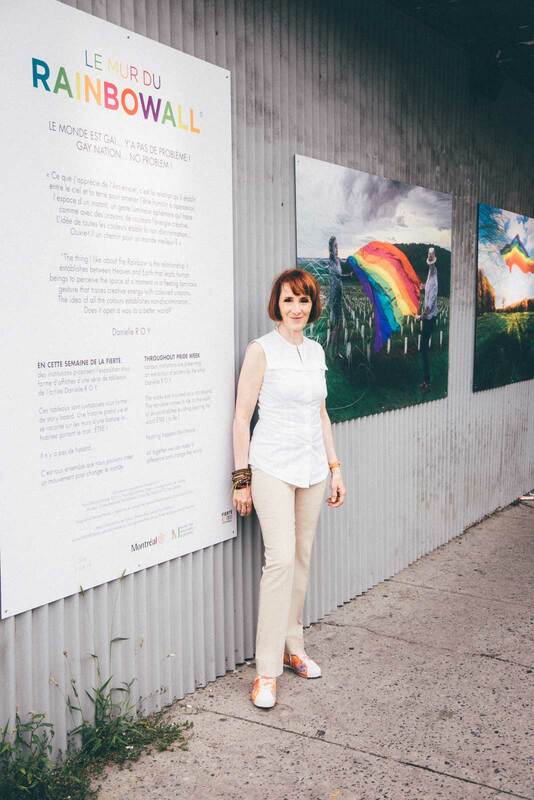 I realized that the work for the fight against homophobia and transphobia is related to all human beings, to all fights for justice and equality.” By using the rainbow as a symbol that links us together as human beings, as a “sign of life,” Roy hopes to spread a message of tolerance and openness—“but without judgment,” she adds. Roy had already begun her work of raising awareness through her participation in the Imaginary Couples exhibit by artist Olivier Ciappa, from France, who had photographed her sleeping beside singer and actress Chloe Sainte-Marie. The exhibition was presented in May 2015 at Complexe Desjardins in the framework of the project The allies show their colors. The LGBT community could not have dreamed of a better ally.